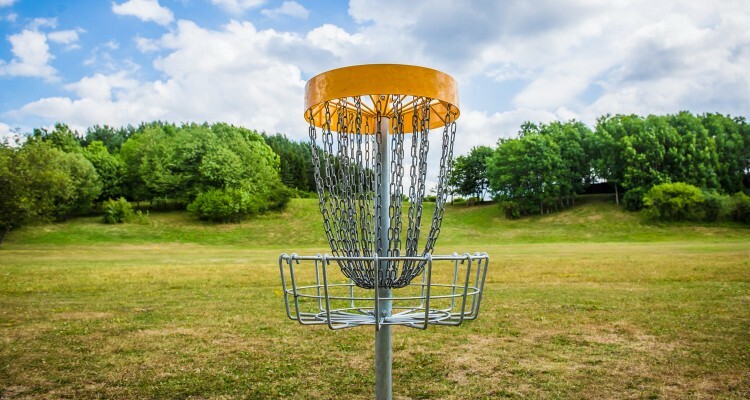 Each disc golf hole begins from a tee. A safe, consistent tee surface will improve the appeal of your course. Tees can be as simple as a pair of painted rocks to designate the teeing area. While some courses have natural tees, the preferred tee is a textured slab of concrete. Natural tees are the easiest to install, and cost little. With time, however, natural tees can wear if not maintained. Natural tees work best in dry climates and sandy soils. Areas that receive a lot of rain or have loose soil should consider concrete. Natural tees can allow time to evaluate if a hole design is ideal before permanent tees are installed. Our plastic Innova Tee Markers can be added for $30 per pair. Concrete tees with a coarse finish provide an ideal throwing surface. They are virtually maintenance free. Properly installed concrete tees can last for decades. A firm, level, slip-free surface is ideal for long power drives. Concrete tees are the most maintenance free, long lasting tee surfaces. For permanent courses, concrete is the logical choice to provide a consistent maintenance free surface for years to come.